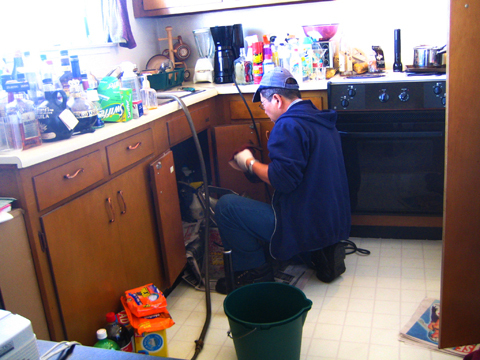 How Can I Prevent Clogged Drains in My Home? © 2016 by Trent Anderson all rights reserved; content may not be copied, rewritten, or republished without written permission. As a concerned homeowner, you may ask yourself how you can prevent clogged drains. We all dread the slow drain. Also, we may even pretend that we dont even hear the ominous gurgling noise. Most definitely, we want to avoid the overflowed or backed up toilet! There are three main items that cause you to need to call a plumber: a clogged kitchen sink, a stopped up bathroom sink, and the non-flushing toilet. Looking at each of these items will help you understand how to prevent clogged drains in the future. Weve all been there. You are washing dishes and try to let the water down the drain on the left side of the sink. Instead of going down the drain to stay, it bubbles back up the right side of the sink. Eventually, it drains. You have this problem every day. Fast forward three months. You wash the dishes, let the water down the sink. Only this time it doesnt bubble up the other side. It sits in the sink. Or worse yet, bubbles up both sides of the sink. After you call in the experts to fix this, you can prevent the clogged drain by understanding what clogs it up to begin with! There are two usual suspects: oils and food particles. Even if you drain your cooking oils or greases into your trash, you still probably have residual oils. Imagine this. You fried up some delicious chicken and poured the oil into a coffee can. Then, you placed the pan into your hot, soapy water in the sink. Right? Wrong! Before you do place your pan into the water take an extra step. Take a paper towel and wipe out absolutely as much oil as possible! That little bit of oil this time, and a little bit of oil the next time all adds up to a big disaster in the long run. Secondly, food particles not properly disposed of can clog your kitchen sink. Similar to the oil scenario, you can help prevent clogged drains by taking an extra step. Carefully scrape all food particles into the trash prior to washing. Another visual. We have all cooked pasta. It starts out small, but expands in water to almost double its size. If you remove pasta from the water at the al dente phase, it is slightly undercooked. This means it will further expand if you let it slip down your drain. In addition to the kitchen, the bathroom sink commonly becomes clogged. Every day, you use the bathroom vanity area to brush your teeth, apply your makeup, wash your face and comb your hair. This means a lot of fallout for your sink! Bits of undissolved toothpaste can accumulate and harden inside the rim of the drain. Hair clumps and accumulates in the trap. In addition, flakes of discarded makeup and exfoliated skin add to this accumulation. This usually starts as a slow drain. Over time it becomes slower and slower. If you havent taken immediate care, you have a completely clogged drain in about three months and need to call your local Sydney plumber. It all makes up quite a nasty sounding clog, doesnt it? Be that as it may, the visual description makes the point. You can prevent clogged a clogged bathroom sink drain by being very careful to make sure that all your toothpaste is dissolved as you brush your teeth so that you are not spitting toothpaste chunks down the drain. Sorry, its nasty but its true. Likewise, after you comb your hair or apply your makeup, wipe stray bits of hair and makeup out of the sink with a piece of tissue and dispose of it in the trash. Also, refer to your sink manufacturer as they may have specific product recommendations. I have saved the most dreaded clog for last. The clogged toilet. The toilet is supposed to serve one purpose. To flush away our waste. Unfortunately, sometimes we have children who think the toilet is a great place to hide their crayons. Or we may have a spouse who uses the toilet to throw out cotton ear swabs. Most definitely, these are not uses that most reputable toilet manufacturers advocate! Indeed, there are items that are the most common causes of toilet clogs. Tampons and baby wipes are often labelled as “flushable.” Dont do it! In fact, these may be manufactured from biodegradable materials. However, these are thick with material and may take months, or even years, to biodegrade. These items are bulky and can cause a toilet very quickly! In conclusion, by taking care to dispose of items that are simply not meant to go down your drains, you can prevent clogged drains in your home. If you do ever need to get a clogged drain fixed, make sure you call a plumbing professional to do the job right!